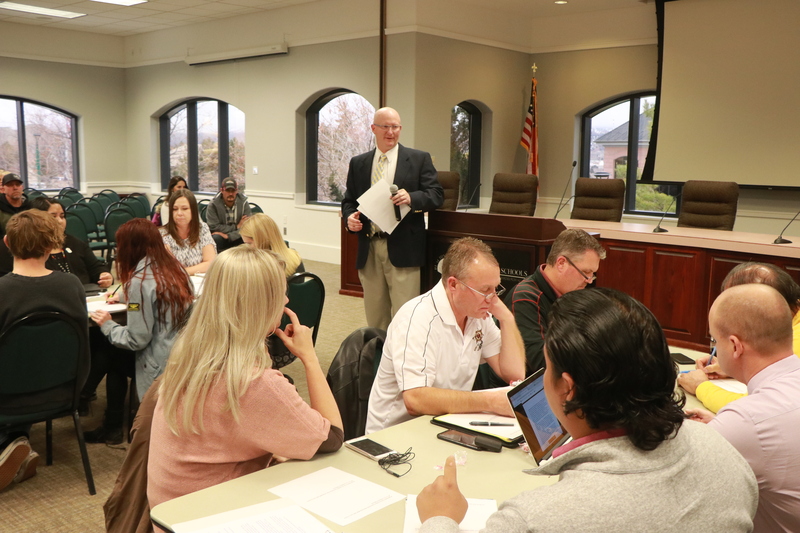 Rich Nielsen, the district’s director of secondary education, said the final decision on the matter will be up to the school board, which meets Jan. 22, at 4 p.m. Committee members were asked to create two separate presentations to make to the board – one in favor of keeping the mascot and one in favor of changing it. Tuesday’s meeting came one day after Monday night’s public forum on the issue at Cedar High. That event marked the third and final public forum, with the first two having taken place in December. Of the approximately 25 people who spoke publicly Monday night, all but a few said they were in favor of changing it. 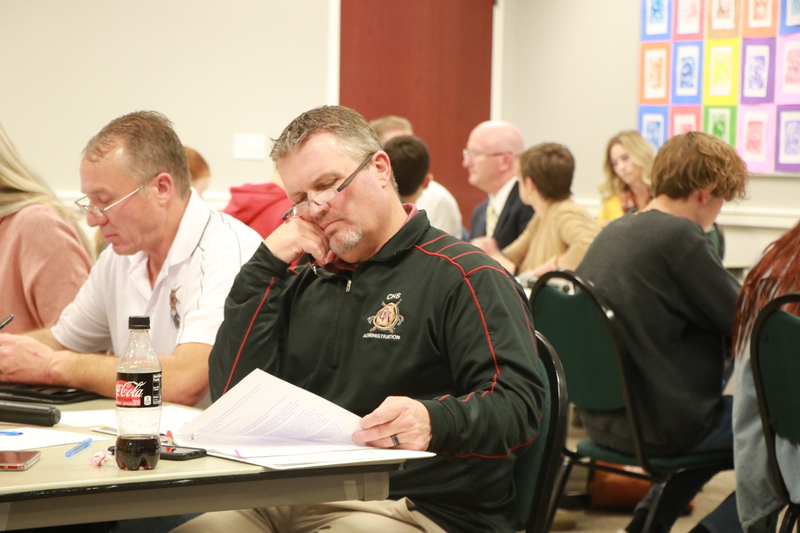 However, of the 232 email messages the committee members received during the comment period that started in early December, 126 were in favor of keeping Redmen as the mascot, while 106 wanted to change it, district officials said. Although many expressed passionate opinions one way or the other, there were others who said they appreciated the process and would be OK with whatever decision was made. The mascot committee, which was chosen by the school board, includes school officials and faculty members, alumni, parents, Cedar High and Cedar Middle school students, Paiute tribal leaders and other members of the community. During the discussion at Tuesday’s meeting, the committee members sat at four tables, with six people at each table. Each group was tasked with discussing and coming up with a summary list of arguments for each side (keeping vs. changing the mascot). Approximately 60 people were in attendance, including the 24 committee members and four journalists. Arguments cited in favor of keeping Redmen included the mascot’s longtime status as a positive source of pride and that it creates opportunities to educate students and community members about Native Americans and their culture in a positive way. The monetary costs associated with changing signage and apparel were also cited as a reason for keeping the mascot the same. Arguments for changing the mascot included the perception by some that the nickname is a racial slur, social media and other pressures faced by students, opposition to the term by many Native Americans, along with potential legal and liability issues. Right before the vote took place near the end of the 90-minute meeting, one committee member expressed gratitude for the opportunity to be part of the process and encouraged his fellow committee members and the public to support the group’s decision. Under those circumstances, lets help the poor committee members solve the conundrum of the mascot. I suggest, THE PRAIRIE DOG. Would anyone be offended by the “Murdering Mormons” as a mascot name? the monument and put arms and legs on it and that could make a mascot. Same amount of letters, and denotes the surrender to the PC police. I say that they should change it to Paiutes — then the tribe can help have a say, it will help educate people more to the specific tribe and their importance to the area, any of the “CR” logos can be changed to “CP” fairly easily, and it doesn’t deviate too far from the original mascot, while moving what some people deem a racial slur. As far as costs go, see if the Adidas fund is still available — they were offering money to help with name/logo changes in these types of situations. Everybody seems to think they are administering the coup de grace to their argument when they ask how we would would like a mascot such as Pioneers or Mormons running out on the field. It has always been my impression that many mascots represent respected people, such as the Beetdiggers up North, representing the historical farmers of the area, or in Manti the Templars, a holy order of knights (with good or bad connotations, depending on your historical paradigm) or the Dixie Flyers, for the airport they were proud of. None of these peoples or modes of life are ridiculed in any way by being chosen as a mascot. The only example of claims of disrespect I have seen has come from Native Americans. Why? Perhaps they are disrespected in other ways and are taking it out on the mascots? Just put the blame where it really lies. I guess I need to add somewhat to my previous comment. As a school bus driver in Cedar City, I knew a Native American boy who wore the costume of the Redman mascot for Cedar High. He liked it, and was well respected. Currently, Native American students ride my bus. I asked one today his opinion. He stated that he didn’t care. It was just a mascot. Personally, I’d rather not go to an animal mascot. We can choose better heroes. Why would we elect to emulate animalistic characteristics over the laudable traits of real people? This all began with a drill team performance which was seen as mocking a sacred dance, although that was not intended, they say. If we choose to adopt animals to model our behavior- examples of conduct we desire to represent our school- are we not possibly also mocking Native Americans? Totemism and Shamanism comes from native peoples in which they obtain spirit animals to guide them, as I understand it. Clearly, it will only be a few years until these mascots are also under attack by these same arguments. Not to mention what will finally happen to the SUU mascot of the Thunderbird if this goes through! Frankly, of all cultures, only the Native Americans, as far as I know, have earned a title descriptive of their awesomeness for their warriors- the Brave! This is the reason for this mascot. It should also be noted that this form of political correctness is quite out of-date. We are now in the age of post-modernism, which states that no one is right, and no one is wrong, and that everyone has their own truth, and that all opinions are equally valid. In the current melieu, we owe it to the future generation to leave this alone. How can we choose sides like this? In today’s society, propriety is found in letting this subject drop without further action.